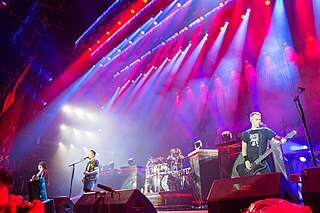 The Metallica By Request Tour  was a concert tour by American heavy metal band Metallica in support of their single Lords of Summer , which was released on March 19, 2014. An interactive tour, concertgoers could vote, via internet, which songs Metallica would include on each night's setlist and, at the concert, via SMS, to a song in the encore. 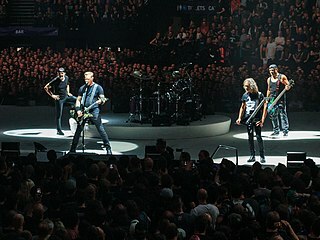 Metallica debuted a new song, called Lords of Summer. Metallica's only stop in North America was in Montreal for the Heavy Montreal festival. List of concerts, showing date, city, country, venue, and opening act. Avenged Sevenfold is an American heavy metal band from Huntington Beach, California, formed in 1999. 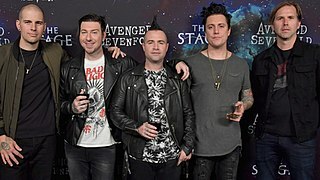 The band's current lineup consists of lead vocalist M. Shadows, rhythm guitarist and backing vocalist Zacky Vengeance, lead guitarist and backing vocalist Synyster Gates, bassist and backing vocalist Johnny Christ, and drummer Brooks Wackerman. The discography of Avenged Sevenfold, an American heavy metal band, consists of seven studio albums, one soundtrack album, one live album, two compilation albums, 31 singles, two video albums and 26 music videos. Formed in Huntington Beach, California in 1999, the band originally featured vocalist M. Shadows, guitarist Zacky Vengeance, bassist Matt Wendt and drummer The Rev. Synyster Gates joined as lead guitarist in 2001, just after the group released its debut album Sounding the Seventh Trumpet on Good Life Recordings, which was later reissued on Hopeless Records. 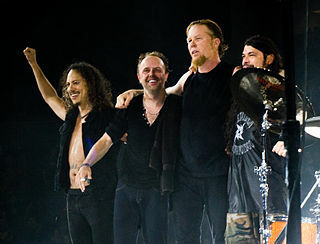 World Magnetic Tour was a 2008–2010 concert tour by American thrash metal band Metallica in support of the band's ninth studio album, Death Magnetic, which was released on September 12, 2008. The Big Four: Live from Sofia, Bulgaria is a live video with performances by Metallica, Slayer, Megadeth, and Anthrax, the "big four" of thrash metal. The concert took place on June 22, 2010 at the Sonisphere Festival at Vasil Levski National Stadium, Sofia, Bulgaria. It was shown at 450 movie theaters in the United States and over 350 movie theaters across Europe, Canada, and Latin America on June 22, 2010. The Avenged Sevenfold Tour was a concert tour by heavy metal band Avenged Sevenfold between 2007 and 2009, promoting their self-titled album. It was also the band's last tour with drummer Jimmy "The Rev" Sullivan who died on December 28, 2009. 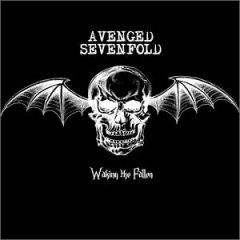 Hail to the King is the sixth studio album by American heavy metal band Avenged Sevenfold. It was released on August 23, 2013 in New Zealand and Australia, and was released on iTunes on August 27, 2013 and in North America on the same day. The album was produced by Mike Elizondo. Hail to the King is the first and only Avenged Sevenfold album to feature Arin Ilejay on drums, prior to his departure in July 2015. It is also the first Avenged Sevenfold album without musical contributions from Ilejay's late predecessor, Jimmy "The Rev" Sullivan; the bonus track, "St. James", was written in his memory. 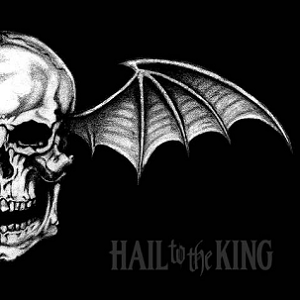 "Hail to the King" is a song by Avenged Sevenfold and the second single from their sixth studio album of the same name, released on July 15, 2013. The song was premiered live on July 17, 2013, at the Ford Festival Park in Oshkosh, Wisconsin. "Shepherd of Fire" is the first single from Hail to the King, the sixth studio album from American heavy metal band Avenged Sevenfold. Released on November 7, 2013, the song was a No.1 single on Mainstream Rock, and is the theme song of the Call of Duty: Black Ops II Zombies map "Origins", included in the final downloadable content compilation named Apocalypse. It is also featured in the mixed-martial arts video game EA Sports UFC. The Melody Road Tour is a concert tour by singer Neil Diamond to promote his 2014 album, Melody Road. Billy Joel in Concert is a concert tour by the American singer-songwriter Billy Joel. After several concerts beforehand, in the fall of 2013, the concert tour began in Sunrise, Florida, and is currently ongoing, continuing into 2019. The Stage is the seventh studio album by American heavy metal band Avenged Sevenfold, released on October 28, 2016 by Capitol Records after a live stream event on the band's Facebook page. It is the first Avenged Sevenfold album to feature Brooks Wackerman on drums, who joined the band in late 2014 but was not revealed as previous drummer Arin Ilejay's official replacement until Ilejay's departure in 2015, because the band wanted to find a drummer that would "fit in". The Stage is also the band's first album to be released through Capitol Records. The Lords of Summer Tour was a concert tour by American heavy metal band Metallica in support of their single Lords of Summer, which was released on March 19, 2014. ↑ "2014-07-09 Vienna, Austria - Metallica". metallica.com. Retrieved 2017-02-20. ↑ "Wayback Machine" (PDF). 2015-09-24. Retrieved 2018-07-23.